Historians differ as to when they believe tea was introduced to Moroccan culture. Although some say it may have been as early as the 12th century, others claim that it was only as recent as the 18th century. If the latter is correct, Moroccans were quick to embrace tea drinking as a norm of their own, resulting in Morocco's current standing as one of the top importers of tea worldwide. Today, Morocco's famous mint tea—green tea steeped with lots of spearmint—has become symbolic not only of Moroccan cuisine but also of Moroccan hospitality and culture. Many families serve the markedly sweet beverage several times a day with or without food, and both drop-in and invited company can expect to be offered tea as a welcoming gesture. While the Moroccan tradition of honoring the guest may be rooted in Islamic etiquette, Moroccans are renowned for elevating that standard of hospitality to an exceptional level. As such, even new acquaintances and unexpected guests will be encouraged to drink glass after glass of tea (to avoid offending the host, it's wise to oblige! ), and then pressed to stay on for a full meal. Although tea making in the West is usually simple, in Morocco the process is a bit more involved. The following steps show how the tea is typically prepared behind the scenes in Moroccan kitchens. A more complex, ceremonial method of preparing tea in front of guests is employed less frequently, most notably at formal, special occasions. This is a typical Moroccan tea service with an engraved Moroccan teapot (berrad), tea glasses and serving tray. Many families own at least one fine tea service which is reserved for special occasions and serving guests, while a more casual pot and glasses are used on a daily basis for family or close friends. What's shown here is middle-of-the-road—neither too fancy for family tea time nor too casual to set out for company. Much more ornate glasses are often used. Most Moroccan teapots may be placed directly over the fire, an essential step in the process of making traditional Moroccan tea. If you don't have a Moroccan teapot, you can buy one online or look for another style of a stovetop-safe teapot. Small 3- to 4-ounce decorated tea glasses can also be found online, or use very small juice glasses in their place. Chinese gunpowder green tea is preferred for making Moroccan tea. The "gunpowder" refers to the compression of the dried tea leaves into tiny pellets; the more compact, the better the quality. A slight sheen to the gunpowder tea is desirable as it indicates freshness. A generous quantity of fresh spearmint leaves—na'na in Moroccan Arabic—is also essential to mint tea. Quite a few varieties of spearmint can be found in Morocco, depending on the region and time of year. While fresh spearmint is the most popular choice for mint tea, smaller quantities of dried peppermint leaves or fresh pennyroyal may also be used, resulting in tea with more pungent aroma and flavor. Moroccan tea is not exclusively flavored with mint, however; other aromatic herbs such as sage, wormwood, lemon verbena, wild thyme and wild geranium are also used. 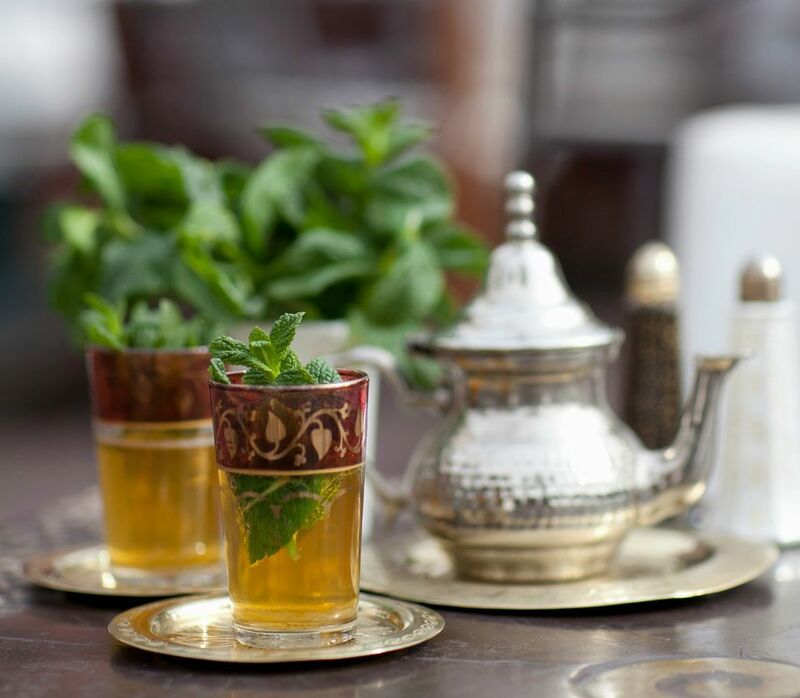 Moroccan mint tea is famously sweet, so do not forget the sugar (unless, of course, you prefer it less sweet due to health concerns or personal taste). Shown here are the two forms of sugar most often used by Moroccans in their tea making—a sugar cone weighing two kilograms, and sugar bricks of about 30 grams each. The sugar cone is preferred by traditionalists and connoisseurs, but since we don't want to break it up—the cone is pretty solid, requiring a kitchen ax to whack it into pieces—we'll be using the sugar bricks. If you don't have access to either form of sugar, know that the 3 sugar bricks are roughly equivalent to 7 tablespoons of granulated sugar. By many Moroccans' standards, this will not be enough sugar to properly sweeten the large pot of tea that we'll make, but you might find that it's far too much. Feel free to adjust the quantity of sugar in either direction to suit your own tastes. Boiling water is, of course, a must for making the tea. Rinse out your teapot with a little of the water before beginning. Now, add your gunpowder green tea to the teapot (We're using two rounded tablespoons here for a one-liter capacity pot) and pour in just a little bit of boiling water—about a tea glass full. Leave it to sit undisturbed for a minute, then pour it out into a tea glass. Note that the tea leaves swell and absorb some of the water, so you won't pour out as much liquid as you poured in. Avoid the temptation to swirl the water around the pot before you pour or you'll dirty the liquid. This amber-colored liquid is referred to as the "spirit" or "soul" of the tea since it contains full flavor from the water's first contact with the leaves. Save this tea; it will go back into the pot a short while later. Now you'll wash the tea leaves. Add another tea glass full of water to the pot. Leave it to sit for a minute, then swirl it around the pot to wash the leaves. Pour out the murky liquid and discard it. Note the difference in color when comparing the undesirable rinse water to the clear, clean "spirit" which will go back into the pot. If you haven't already washed your mint, do so now. The most effective way to wash fresh mint (and other herbs) is to immerse it in a bowl full of water, swish it around, then lift out to drain. Here, we are also preparing sheba to add to the tea along with the mint. Just a sprig or two is usually sufficient, as the herb is quite strong. Wash it by briefly soaking it in boiling water, which is simply poured over the sprig in a tea glass. (Note how the sheba's color changes when it makes contact with the hot water.) This method removes some of the bitterness associated with sheba. Now that the tea leaves are washed and the herbs are ready, fill the pot about two-thirds full with boiling water and place on a burner over medium-low to medium heat. Pour the reserved "spirit" back into the pot. Once you see bubbles forming on the surface of tea, add a bowlful of fresh mint—gently push all the leaves down into the pot to submerge them—and then add the sugar. Here we've also added the sheba. At this point the pot should be quite full; if the water level hasn't risen to within an inch or so of the brim, go ahead and top off the pot with a little more boiling water, but do leave some room to allow for boiling. Leave the tea on the fire until it comes to a boil. You'll first notice that the mint leaves rise to the top, but, ​eventually, the green tea leaves will break to the surface as the liquids become bubbly and foamy. You can remove the tea from the stove now. There's no need to stir. If the handle of your teapot isn't heatproof, it will be quite hot. Use a cloth napkin or handle cover for picking up the pot and serving. Instead of stirring, Moroccan tea is traditionally mixed by pouring the just-steeped tea into a glass, and then pour the tea back into the pot. Repeat this process 4 or 5 times. This mixing can be done in the kitchen or in front of guests. A Moroccan teapot has a built-in strainer which prevents loose tea leaves from pouring out of the pot. If your own pot doesn't have this feature, hold a strainer over the glass as you pour. Also note that the long, curved spout of a Moroccan teapot allows for accurate pouring from high above the glass, which helps to aerate the tea so that a desirable foam head will form on the surface. Once the tea is mixed, it's ready to be served. Pour out the glasses of tea about 2/3 to 3/4 full. Try to pour from an arm's length above each glass to get that nice foamy head. Some Moroccans place a sprig of fresh mint leaves directly in the glass of tea. Moroccan tea can be served with meals, dried fruits, and nuts, an array of sweets or other Moroccan tea time recipes. Or you can choose to serve with absolutely nothing at all. You may also use other herbs or spices in place of mint. How to Make Your Own Panini Rolls - It's Easy!